Use Paughco Axle Kit #186A, 1984 to 1999, single flange hub, FXST or FXWG. If FXWG hub is used with Speedo drive, the non-flange side must be notched to accept the tab. For use with 11.5" rotor. 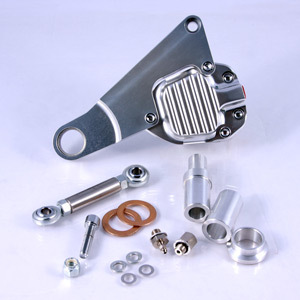 Includes bronze washers, rod ends, axle spacer and bushings. Not designed for use with Paughco fender 182A.